K9 Crystal is the most beautiful, the most sparkling, the most Rainbow-Tossing stunning delicious Crystal on the market. Our K9 Crystal is not your standard Glass Crystal, and this is not your standard Beaded Curtain. We have THREE videos for you to watch below to help you make the best buying decision. 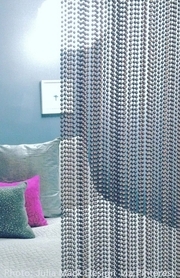 This curtain is made using our quality K9 Crystal Beads that are absolutely DEVINE! There are many grades of Crystal, K9 is Superior! 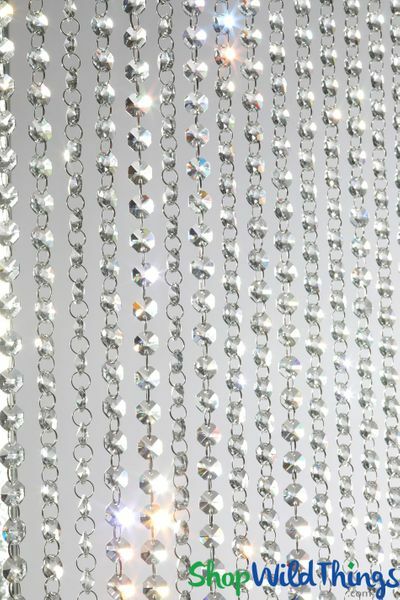 If you need a Sparkling Beaded Curtain that will drop all jaws, be so drool-worthy that people try to steal it, you are in the right place. The price may seem high. It's not. Not for this crystal. We negotiated the price WAY down to the price of standard glass that will not sparkle this way. When you see a Swarovsky Crystal Curtain on a stage, those can cost in the hundreds of thousands of dollars. We know. 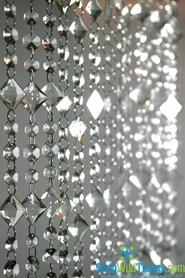 If you need something way less expensive, make sure to check out our Acrylic Beaded Curtains. They are very pretty and start at $19.99. 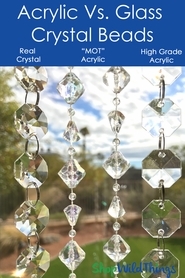 We offer styles that have jump rings in between each High Grade Acrylic Bead, and we also offer our special Acrylic Curtains that are "Molded on Thread" and can be trimmed with scissors. We have a ton of options available here at ShopWildThings, making us the premier destination for all of your Event Decor needs. This Real K9 Crystal Curtain can be made with a Straight Metal Top, a Bendable Metal Top, or a Fabric Strap Top. Just let us know what you want, as this item will be made to order just for you in our Arizona Fabrication Studio, by American Workers. Each curtain will come with 18 Strands. This item is Made to Order for you in our Arizona Studio by American Workers! The lead time is approximately is 10 - 14 Days. When we were testing these crystals, when the sunlight hits them, the rainbows went across the room more than 30 feet away an lit the rest of the room in color! They're so spectacular. We can make any size curtain that you would like. The Square Foot Price for a completed custom curtain in any size you'd like is $12.99 for 6 Strands Per Foot. The curtain on this page is almost 3' Wide x 6 Feet Long = 18 Square Feet. That's for a total of 18 strands for every 35" Wide section. If you'd like a custom size made, just give us a call and we're happy to quote that for you. If you'd like less strands to get the price down, that's also an option. We are always happy to help you meet your budget by getting creative! This video will show you the Straight Metal Rod. You can also choose from a bendable Metal Rod or Fabric Straps. The video below will show you this actual curtain - but it is so much more sparkly in person! 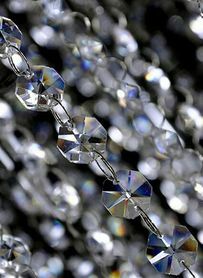 Real K9 Crystal Sparkling Beaded Curtain 35" x 6 Feet Long Custom Sizes Available!